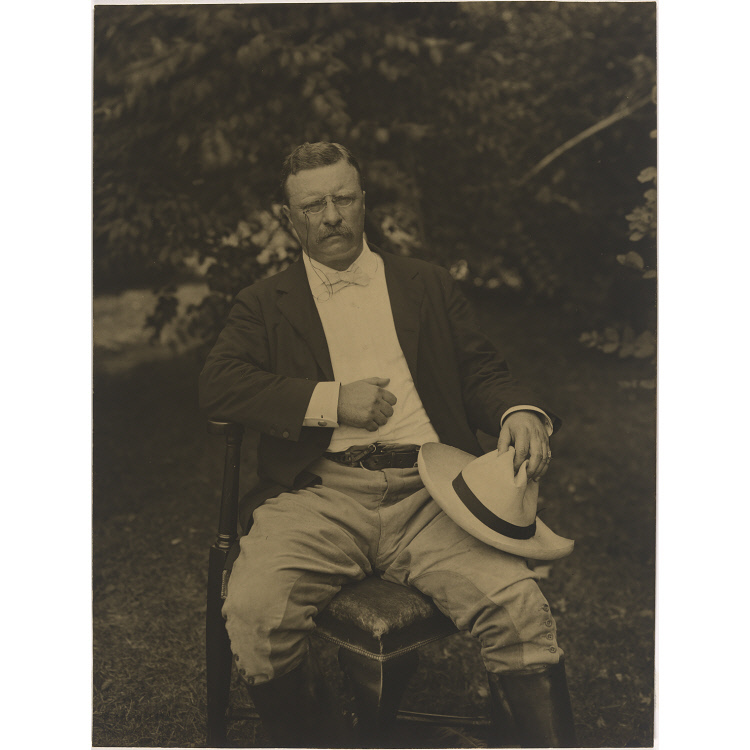 Theodore Roosevelt entered the White House in 1901 with a dynamic view of the presidency. He infused vigor into a branch of government that for thirty years had been dominated by Congress. For Roosevelt, whose personal energy mirrored his professional drive, riding and hiking were part of his routine. One senator even quipped that those wishing to have any influence on the president should first buy a horse. This photograph by Peter A. Juley shows Roosevelt dressed in his riding clothes. The image appeared on the cover of Harper’s Weekly on July 2, 1904. Theodore Roosevelt llegó a la Casa Blanca en 1901 con una idea dinámica de la presidencia. Le infundió vigor a esta rama del gobierno que durante treinta años había sido dominada por el Congreso. Para Roosevelt, cuya energía personal iba a la par con su dedicación profesional, montar a caballo y hacer caminatas eran parte de su rutina. Un senador llegó a comentar en broma que quien quisiera tener influencia en el presidente tenía primero que comprarse un caballo. Esta fotografía de Peter A. Juley muestra a Roosevelt en atuendo ecuestre. La imagen apareció en la portada de Harper’s Weekly el 2 de julio de 1904.